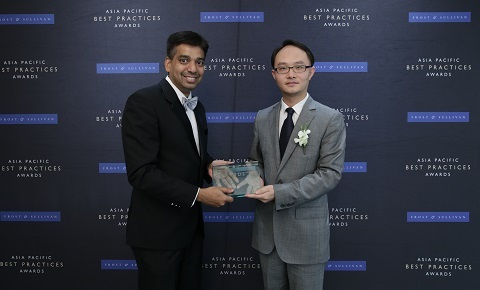 (Right) Yan Xuguang, Director of Integrated Solution, Huawei Singapore receives Telecom Equipment Vendor of the Year award from Ajay Sunder, Vice President, Digital Transformation, Frost & Sullivan. Huawei’s strategic mission as a telecom equipment vendor is building a Better Connected World, enriching people’s lives through communications and improving work efficiency. As information and communications technology (ICT) is converging at an increasingly rapid pace, new technologies, especially Cloud Computing and Big Data, have emerged as key enablers for ICT innovation and development. In response to these revolutionary changes, Huawei continues to innovate around customer needs, focusing on development of leading technology that meets those needs. Huawei encourages formation of industry alliances and partnerships with businesses, open source communities, and developer platforms to unleash greater potential for innovation, which promotes the growth and sustainability of the ecosystem. With a proven track record, Huawei continues to outdo itself by clinching the Telecom Equipment Vendor of the Year award. "Huawei is one of the most trusted & strategic partners for CSPs for their network infrastructure, cloud based solutions, and associated services. With its strategic mission to build a ‘Better Connected World’, it continued to bring innovations in emerging domains like cloud computing, SDN, NFV, 5G, etc. and brought significant advancements to the telecom industry. The company pursued its customer-first principle and remained committed to help carriers increase their network capacities and optimize their networks. It also offered custom-tailored solutions that significantly benefitted CSPs by enhancing their customer experience and helped them monetize the emerging digital opportunities,” said Avinash Sachdeva, Senior Analyst, Telecoms, Digital Transformation Practice, APAC Frost & Sullivan. “Huawei will continue to invest in innovation and drive evolution in technology and human interaction to create a Better Connected World for everyone,” added Lim. For more information, please log on to http://huaweiapac.mediaroom.com/.